The Big Data Congress brings together business leaders from the Maritimes and around the world to learn about, discuss, and be inspired by different ways that they can leverage big data and analytics to add value to their businesses. With representatives from industry, government, and academia, the goal is to spark new ideas and encourage new partnerships. Big Data Congress is hosted alternately in Saint John, NB, and Halifax, NS. This year, Big Data Congress 2017 was at the World Trade and Convention Centre in Halifax, Canada’s ocean city. Appropriately for the location, the theme of the conference was Oceans and Earth with a focus on agriculture, oceans, energy, and other related industrial sectors. I’ve conducted ecological research in both marine sediments and agricultural soils, so I was especially excited to see talks that combined my favorite topic (data!) with my favorite ecosystems! Just as exciting was the opportunity to moderate a panel, entitled Data from the Skies, on big data and remote sensing in agricultural systems. T4G was a proud top-level sponsor of Big Data Congress 2017 and had a strong presence at the conference, with T4Gers presenting at two other sessions (Darryl Dutton and myself during Apps and Analytics Converge, and VP Gary Filan during Visual Analytics for Business) and hosting a Mixed Reality Mixer and Hololens demo on Tuesday evening. From the Monday morning keynote through to Wednesday morning’s Visual Analytics panel, the convention centre was abuzz with conversation and excitement. The audience was largely business-focused, with lunch table discussions focusing around how to incorporate big data tools and skills into businesses. Attendees were generally at the conference to learn about and gain exposure to this sort of information, as well as to connect with potential collaborators who could help them better understand potential uses of, and entries into, big data and analytics. The conference agenda had three main tracks: Ocean, Earth, and Tech/General. Topics for discussions and presentations ranged from food security in aquaculture, to analytics, apps, and start-ups addressing sustainability at different parts of the industrial food process, to maritime security, to weather analytics. Future Employees: Analytics Skills and Beyond was one of the most well-attended general panels. Participants across the spectrum of hiring interest attended, from students trying to learn the right data and tech skills to position themselves for jobs after graduation, to teachers and professors trying to equip their students with these skills, to business people trying to figure out where to find the best talent. From the energy of everyone in the room, it was clear that many people are invested in making these matches work! There were also many well-attended and insightful keynotes throughout the conference, with one ocean and one agricultural keynote on each of the first two days, and a visual analytics keynote on the third. My favorite keynote was by Dr. Malcolm Campbell from the University of Guelph, on the many different projects and initiatives involved in their Food From Thought program. He spoke about a wide range of interesting uses of data and analytics in the agricultural industry, including blockchain for tracking things like non-GMO soybeans (“identity-preserved soybean”). He also discussed a range of challenges in the field that applied to other industries as well. Dr. Camobell emphasized the need to work respectfully with farmers and to understand their needs and concerns around data practices and sharing. In aquatic systems, Dr. Harry Kolar from IBM Research discussed the application of modeling and analytics to real-world environmental management, including in the context of environmental management of Lake George, in the Adirondack Mountains of New York. This project aims to predict how disturbances such as heavy storms, road salt runoff, or invasive species introductions could affect the lake ecosystem. I was fascinated by the way IoT approaches were used to gain an understanding of a complex ecosystem, enabling a sophisticated level of monitoring and management. The visual analytics keynote was by David Ebert from Perdue University, who spoke about a variety of systems that used visual analytics to facilitate what he called human-computer collaborative decision making. This process enables users to be more effective through innovative interactive visualization, analysis, and decision making tools. One takeaway that I found particularly interesting was his discussion around problems of scale, in terms of finding the natural spatial or temporal scale to address a problem, and the challenges of reasoning over multiple time frames. The first panel that T4G participated in was Apps and Analytics Converge, which we shared with Mobia Technology Innovations. After Mobia presented on their integration of analytics in custom applications, Darryl and I discussed a sample architecture that integrates a variety of development and analytics tools, including Docker, Python, and the Face API from Microsoft Azure Cognitive Services. We demonstrated this application through our toy Accessorizer app, which takes a selfie and uses a random forest classifier to recommend whether the user should add a hat, scarf, or glasses to complement their style. The room was packed for our session. Many attendees had follow-up questions and interest in the architecture of the system as well as the machine learning model and its optimization. Some questions, during and after the sessions, focused on the process context for integrating apps and analytics. More specifically, they dealt with things like working with people whose skills differ from your own and the need for a common vocabulary. For example, a woman in the healthcare industry asked whether analytical models needed to be fully formed before beginning to work with IT or developers, or whether it made sense to partner with them during development. We discussed the need to have a reasonable sense of what you want to do before starting a collaboration, but also the iterative nature of the analytics and development process, and how a working partnership could magnify the possibilities of what could be developed by bringing together different perspectives. On Tuesday morning, I moderated a panel on remote sensing and big data in agricultural systems. Agricultural systems are incredible, because they are the most human-managed ecosystem on our planet, but they are also extraordinarily complex ecosystems with processes happening well beyond our control. This means that the success of a farmer or agricultural manager is dependent on an interplay of factors, at temporal and spatial scales that range from miniscule (water molecules and microbes) to gigantic (large-scale climate processes). Through three presentations and a lively discussion, Scott Hatcher (PrecisionHawk), Kevin McGuigan (NSCC), Peter Goggin (Resson), and I explored how agricultural remote sensing data is, and can be, used to begin to make sense of all of this complexity. Especially interesting to me was our conversation about the challenges around groundtruthing and data integrity. With remote sensing, you’re depending on potentially autonomous or largely unattended processes to collect data that then needs some sort of interpretation or calibration to be understood. It was interesting to hear how each panelist had addressed these challenges, and the trouble that they sometimes ran into. For example, undergraduate students are affordable data-collectors, but may be tempted to estimate plant counts rather than counting each one individually. On Tuesday evening, T4G hosted a Mixed Reality Mixer at the Bitter End. It was a fun event to showcase our latest collaboration with Microsoft in cutting-edge augmented reality, which uses a combination of HoloLens, IoT Hub, Azure and Power BI to demonstrate an industrial IoT solution. People packed the bar, appreciating the good conversation, cocktails, and – of course – oysters! Finally, on Wednesday, Gary Filan and Jason Lee presented this Hololens demo during the morning’s Visual Analytics panel. Gary discussed the idea that the most effective use of data visualization is when it’s put into a process. Whether that’s a retail buying process or some part of an integrated workflow in an industrial IoT environment, the right visualization can help someone non-technical use data to make decisions. This often means having the right data at the right time, when you’re physically present and have the context of your surroundings. Gary and Jason helped the audience visualize this process with a demo of the Hololens IoT augmented reality system presented at the Bitter End the night before. 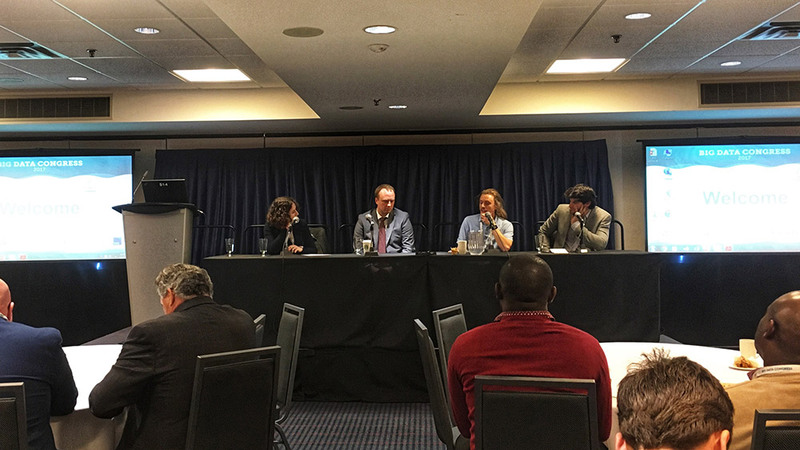 Big Data Congress 2017 was a great trip – from interesting sessions to one-on-one conversations to an early-morning bike ride with VP Jason Lee and the excellent meals in Halifax’s restaurants. I am looking forward to next year! Lindsay is a motivated, curious, and analytical data scientist at T4G Limited. With more than a decade of experience with research methods and the scientific process, she excels at asking incisive questions and using data to tell compelling stories, and is skilled at translating insight into impact. Her graduate work with the Marine Biological Laboratory (Woods Hole) and postdoctoral research at Agriculture and Agri-Food Canada, in combination with her background in computational programming and data analysis, gives her an ideal perspective to draw on for this year’s Big Data Congress. When she’s not joyfully up to her knees in data, she can be found trail running, backpacking, hiking, doing yoga, cooking, or playing drums in a rock band.